Nathan Fuller becomes the 19th state champion from River Falls. Girls practices offered on Sunday nights, 6:00-7:30 PM. Sign-up for the 2018-19 Youth Wrestling season NOW. 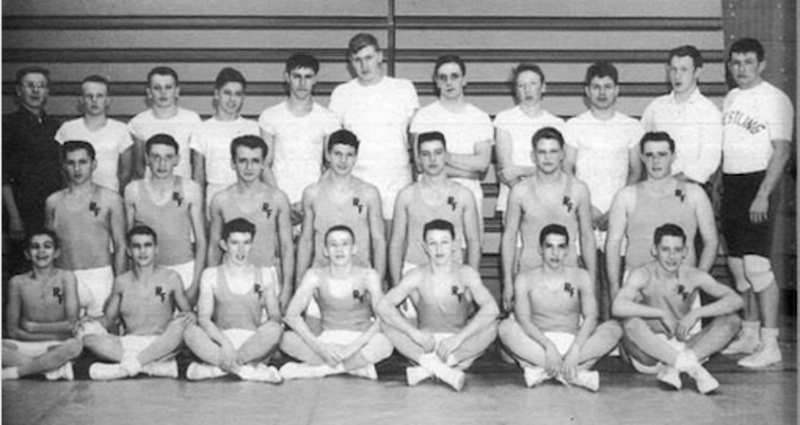 1963 RFHS Wrestling Team. Head Coach Bill Wright. River Falls has one of the most recognizable and successful wrestling programs in the state of Wisconsin. It has been the home of the prestigious Northern Badger Wrestling Classic for almost 20 years and was the birthplace of the WWF Kid's Folkstyle State Tournament series (est. 1988). River Falls High School added wrestling in 1963 with coach Bill Wright and created a non-profit youth wrestling organization and booster club in the 70's. Dave Amdahl, Dave Black, Paul Cudd and Kirby Symes are all members fo the National Wrestling Hall of Fame (Stillwater, OK) and Amdahl, David and Kevin Black and Symes are also members of the Wisconsin Wrestling Coaches Association George Martin Hall of Fame. 12 former wrestlers and wrestling enthusiasts are members of the Wildcat Hall of Fame (DeWayne Benedict, Mike Benedict, Kevin Black, Tony Black, Doug Branigan, Joe Cudd, Pauly Cudd, Dave Brandvold, Paul Cudd, Sr., Howie Nelson, Kirby Symes and the 1997 Wrestling Team). RFHS graduates have earned 4 NCAA Division 1 All-American honors (K. Black, T. Black and Brandvold), 3 NCAA Division 3 All-American honors (B. Cudd, S. Johnson, G. Pope) and many NAIA and USA Wrestling/AAU All-American honors. Most recently, Nathan Fuller finished 7th at the 2018 USA Wrestling Folkstyle National Championships at 160 pounds. The Wildcats have had an abundance of success at the WIAA state level with 19 individual state titles and 70 state placement medals from over 121 state qualifiers. The Wildcats have qualified for the WIAA Team State Tournament 5 times and have won 14 conference team titles in the Middle Border and Big Rivers Conferences. Athletes have won 127 individual conference championships, including 4 athletes who have won 4 conference titles, 5 with 3 titles and 18 2-time conference champions. They have also won the team title at the Northern Badger 3 times and finished as runner-up 6 times (including last season). 30 individuals have won Northern Badger titles. In 2019, Nathan Fuller won a state title and the team won a Big Rivers Conference championship. 10 wrestlers have achieved undefeated season and one finished with an undefeated career. 13 wrestlers have more than 100 career wins and 12 wrestlers have more than 50 career pins. 21 wrestlers have achieved at 40 or more wins in a season, 80 with more than 30 and over 144 with more than 25. Check the "Records" page for more details about the program's history of success. To develop championship athletes and individuals who reach their full human and athletic potential with high character and moral integrity and leave RFHS ready to change the world for good. 1. Providing the opportunity for student-athletes to seek and achieve their athletic, academic and personal potential. 2. To develop the CORE VALUES of humility, accountability, self-respect, leadership, citizenship, discipline, sportsmanship and integrity. 3. To fostering school unity, school spirit and pride in our school and athletic teams - Once a Wildcat, Always a Wildcat. 4. Encouraging student-athletes to participate in multiple sports and play sports competitively after high school. 5. Integrating the community and local youth wrestling programs into the River Falls High School wrestling program. 6. Promoting our athletic department, wrestling program, student-athletes and school district locally, statewide, nationally and internationally. 7. Complying with the rules and policies of the WIAA, NFHS, USA Wrestling and the River Falls School District. 8. Impact, influence and impart with a vision for individual success that rejects passivity, accepts responsibility, leads courageously and expects a greater award (transcendent cause). ©2019 River Falls Wrestling Program / SportsEngine. All Rights Reserved.